AXA, part of the Allegion family of brands has launched its brand new range of door hardware products. AXA is a specialist manufacturer of door and window fittings for residential applications, offering effective solutions and high quality products. 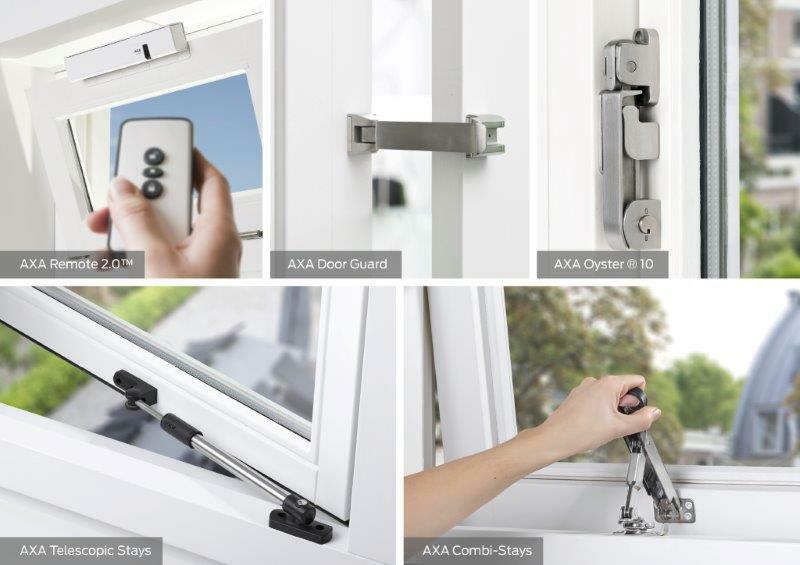 The new release of products includes: AXA Oyster ® 10, AXA Remote 2.0™, AXA Door Guard, AXAflex Combi-stays and Telescopic stays and are available to the UK market. The AXA Oyster ® is a unique product to the market and combines a window fastener and stay in one. This means that only one product is needed for the window, instead of the usual three. The product can be safely used for ventilation in two positions and has a built-in damper that absorbs any gusts of wind. AXA Remote 2.0™enables users to open and close windows in their home easily, quickly, securely and remotely. The product allows natural ventilation and fresh air with just a push of a button and can be powered by solar. AXA Door Guard is a safe and highly secure option for residential front doors, enabling users to open a door slightly to see who is there, and restrict access if necessary. The AXAflex Combi and Telescopic stays are the leading products in the field of ventilation, and have been for decades. These products provide an all-in-one safe and efficient window product. All of the products listed meet current safety and security requirements for ventilation and all come with guarantees of up to 10 years. Although products are primarily suitable for residential security, they can also be used across other applications such as commercial, leisure, healthcare and education. For further information about the products and the benefits, you can view the brochure here. You can contact Allegion on contactuk@allegion.com. Visit www.allegion.com/uk for more information.